with Customer Open House Event. 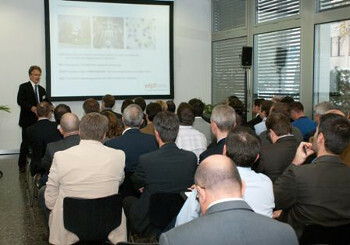 Wipf held a customer open house at its premisesSwiss based Wipf Group has held a customer open house event at its headquarters in Volketswil to officially launch its HP Indigo digital printing capabilities for flexible packaging. Founded in 1914, the company has a number of divisions, one of which is the production of flexible packaging for the food, pharmaceutical, hygiene and construction industries. The family-owned business attributes much of its continued success to high-quality production methods, as well as its ability to adapt to changes in the marketplace. One way in which Wipf maintains its competitive edge is by supplying cutting-edge products and services. Most recently it launched new digital printing services with the installation of an HP Indigo WS6600 Digital Press to allow it to offer customers shorter runs and quicker turnaround times. The company demonstrated the benefits of its new services at the customer open house event, held in association with HP. Wipf highlighted how clients who have started to embrace its digital services are already reaping the benefits. As a result of the positive success Wipf experienced after it made its first step into digital printing services, the company has now revealed plans to expand these capabilities and become the second European beta site for the recently announced 762mm (30in) HP Indigo 20000 Digital Presses (available in 2013). Wipf believes that the larger format of this recently launched HP Indigo press will allow it to offer new applications and more importantly from the company’s perspective, explore new market opportunities not previously achievable with digital technology.